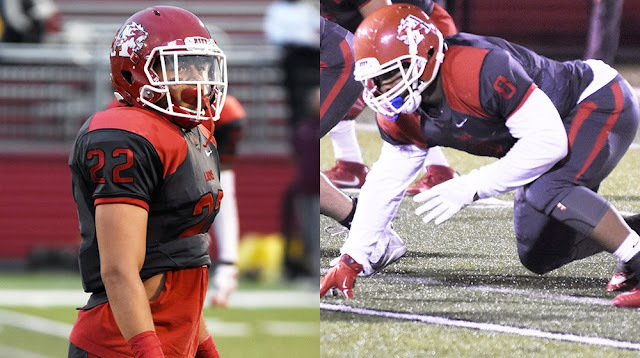 ANNVILLE, Pa. - Albright senior football players Kali Boyce and Isaiah Baylor were two of 25 players selected to the 2017 Football Academic All-MAC Team, announced Wednesday morning by the conference. The players were selected based on academic and athletic excellence. Boyce earned a 3.22 GPA as a business administration major. He was All-MAC Second Team and was elected as a College Player of the Year by the Touchdown Club of Southern New Jersey. Boyce led the MAC in interceptions, and he finished fourth in the league in passes defensed. He was also named MAC Defensive Player of the Week following a two-takeaway performance in a win over Lebanon Valley. Baylor maintained a 3.20 GPA, also as a business administration major. He was named to the All-MAC First Team and the D3football.com All-East Region Third Team. Like Boyce, Baylor was selected as a College Player of the Year by the Touchdown Club of Southern New Jersey. Baylor was the Division III national leader in forced fumbles. He also finished third in MAC in both sacks and tackles for loss while finishing 19th nationally in tackles for loss. Baylor won both ECAC and MAC Player of the Week awards for his 12 tackles, three sacks, five tackles for loss, forced fumble and fumble recovery in win over King's. "These recipients represent the true meaning of a student-athlete," said Executive Director Andrews. "This is one of the top conference awards we give out each season. It honors our student-athletes who excel both in the classroom and on the playing field." The MAC sports information directors nominate and vote for the Academic All-MAC teams, giving 50 percent weight on both academic success and athletic success. A student-athlete must have a fall semester grade-point average (GPA) of 3.20 or higher to be eligible for the award.